Kids who are serious about their sport (and so very many are) absolutely love instructional books that give them the ins and outs of play. 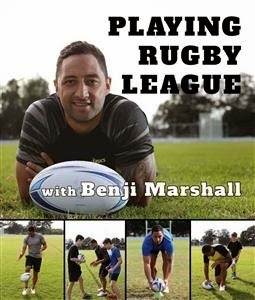 For rugby league players, personalised instruction from legendary New Zealander Benji Marshall seems almost too good to be true. The truth shall set you free, young footballer, for here it is--in one mega volume--an instructional tome for both serious players and those who just want to improve their game. Benji takes kids through a well-structured series of tips and tricks to hone their skills. Starting with touch footy for the younger players, the book advances through the object of the game, passing, kicking, goal-kicking, tackling, fitness, the right gear, and onto advanced levels like captaincy, leadership, coaching and professionalism. Details are impressively thorough--who knew there was a difference, for example, between passing to teammates into space, passing short balls or throwing a cut-out pass?? And what about flick, bullet, scissor and no-look passes?? Coupled with step-by-step photos and easy-to-read instruction, this would suit kids as young as 8. Footballing terms are also explained, and there's some really interesting background material on the game and how it has evolved. Kids will be agog at Benji's story and his 10 Great Games. A must-read for league pros of all ages.